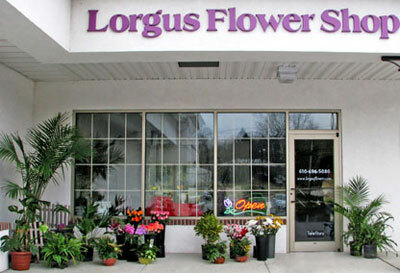 Lorgus Flower Shop is a full service, professionally staffed, design center for all your floral needs. From a single perfect rose to the most elegant wedding Lorgus Flowers will provide you with the beautiful arrangements and gift baskets you need to delight and please. Our designers, with over 60 years of experience, will work with your ideas to achieve the arrangements you envision. Our prices are very competitive and we deliver to West Chester and the surrounding communities. We are conveniently located in East Bradford Shop's at the western end of the Neilds St. on Rt. 52. *Our shop is open from 9:00 a.m. to 5:00 p.m., Monday through Friday, on Saturday 9:00 a.m. to 1:00 p.m. We are closed on Sundays. To help assure on-time delivery during the busy holiday season, please place your order at least 1 day prior to the holiday. Our shop will always be closed on the following holidays: Thanksgiving Day, Christmas Day, New Year’s Day, Memorial Day, Independence Day, Mother's Day, Father's Day and Labor Day. Our shop serves the following areas: West Chester, Malvern, Westtown, Thornton, Frazer, Birmingham, Chester Springs, Lionville, Exton, Guthriesville, Downington, Pocopson, Kennett Square, Mendenhall, Longwood, Kendal, Crosslands, Hershey's Mill, West Chester University. Our shop is known throughout Chester County for a beautiful selection of flowers, stunning contemporary and traditional designs and outstanding customer service. 610-696-5080 or (800)872-0183. We're always here to serve you and make your flower-sending experience a pleasure.